Oh people. How you make me despair. 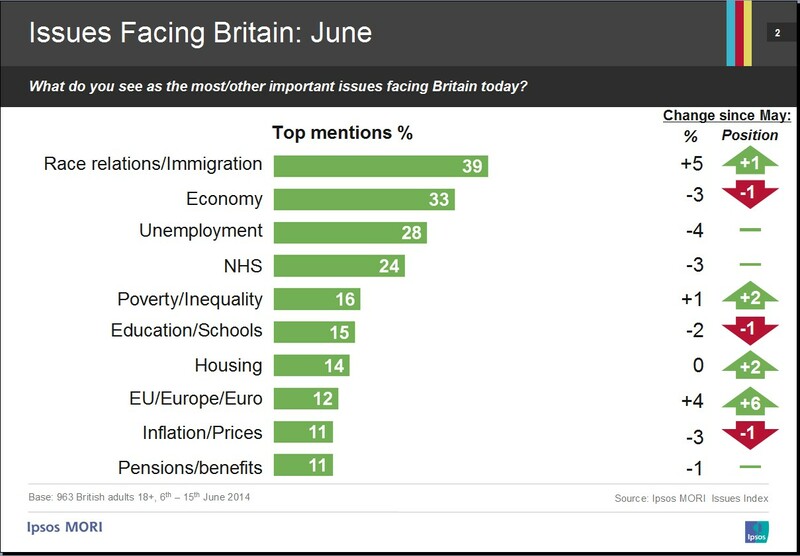 The economy for the first time in recent history is not top of the list of issues that people think are effectively the UK (immigration has tied with the economy before) as immigration now has a sensational six-point lead in the latest Ipsos Mori issue index. This is undoubtedly due in part to the European elections and the amount of air time that UKIP have been getting. The more rubbish they spew the more people believe it and therefore the more airtime they get and therefore more people believe it and so on. It just goes on and on and the media’s determination to build up UKIP has led to more people worrying about our immigration policy than how the economy is doing. Just how backward is that? I know on one hand you could argue that this is good news for the coalition parties, people aren’t worrying about the economy as much and therefore it gives credence to why the coalition formed in the first place. If come polling day in 2015 the economy is bouncing back nicely, unemployment going down and job creation going up then it is likely that both parties can look in the mirror and think they’ve done a good job. Problem though is that if this polling data is accurate then people care more about immigration policy and I think it is fair to say that these people aren’t the type of people that are worried that our borders aren’t open enough. The isolationists are starting to makes their voices heard. These are the people that blame foreigners for their own problems instead of actually finding the problem. Do I blame foreigners for the fact I’m unattractive to the female species? No, no I don’t. Are foreign men coming over here and wooing females that I would have had a chance with? I doubt it. I’m just not an attractive man. Of course at this point I’m kinda taking the mick but I think you get my point (although my attractiveness and lack of it has been well researched and backed up by copious amounts of evidence). People are worried about foreign people coming over here and abusing our benefits system. You know what, some do. You know who also abuses the benefits system? British people. Is it ok that British people abuse the benefits systems? Do they have more rights to abuse it because they were born here? Nigel Farage abuses the expenses system at the European Parliament and he is lauded for it. Other people abuse the expenses system in Parliament and they go to jail and the public derides them. It doesn’t make sense. It is like there is one rule for one set of people and one for another. It is a joke. It goes against the basic principle that we are all equal. Ding, Ding, Ding – we have a winner! What’s this? You have won the award for hitting the nail on the head of the UKIP voter – they believe that we are not all created equal. People that are different should not have the same rights, when I say people who are different, what I really mean is people who do not share their philosophies and thought processes with. Of course not everybody that votes UKIP believes that but it is a general point. Obviously I have a different viewpoint. For example the Ipsos Mori issues index has the NHS as the fourth largest issue facing the country today. You know another thing? If UKIP had its way and pulled us out of Europe and basically closed our borders then the NHS would collapse. There are so many EU and non-EU staff within the NHS that we should be eternally grateful that they choose to come over here and provide vital care for us. If I am in a traffic accident then I don’t care what nationality the doctors and nurses are and nor should anyone else. Caring about that is about as flat out dumb as you can get but heck people do. It beggars belief. The point though is the media are fanning the flames. The majority of people in this country care mostly about the economy. I know this not because I’m spoken to every single person in the land but because it is sound logic. If people have a job and have money then they can afford food and a roof over their heads. That always has to be the first thing on the minds of any person. Whether foreigners are working here or claiming benefits here should never ever be the most important issue. Never. This data doesn’t shock me although it does sadden me. The issues of the EU and immigration were always going to rise the more people heard from UKIP. The more people get told that something is a problem then the more they will believe it. I just hope the other parties don’t just lurch to the right because of this type of data. I fear that at least two of the parties will and that in itself will fan the flames even more. The more people get told something is a problem the more they will believe it and if UKIP, Conservatives and Labour all chase these votes then boy we are in for a depressing feeling in this country for many years to come.